As many people seem to know, shortly after high school I began working at Lucasfilm. My only claim to fame was working as a production assistant on Raiders of the Lost Ark (no, my name is not in the credits so don't look for it). I met my future wife while working there and moved to Los Angeles to join her. I went to film school at UCLA and worked in the industry for about seven years (most notably for a time with the late great Harold Ramis, of Ghostbusters fame). I got tired of that, did some odd jobs, and eventually went to law school. I didn't start practicing right away because I spent 7 years as a househusband, caring for my two sons (then 4 and 1) while the wife worked. Danny graduated from Cal State Long Beach and is not starting a music career. Brian is at Cal Poly Pomona. I've been practicing law since around 2003, currently handling criminal cases. Got divorced this year. Most of my memories pertain to the time I spent in the theater department. I think most people who know who I am know me from the plays. I don't know that I appreciated those times back then as much as I should have, but I realize now how important they were. I even got in touch by email with Sally Rupp, the teacher who was in charge at the time. Last contact I had with her she was doing theater in San Diego. Mark Beallo has a birthday today. 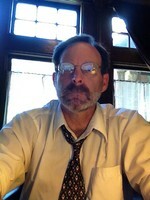 Mark Beallo updated profile. View. Mark Beallo added a comment on Connie Riordan Green's Photo. New comment added. Mark Beallo changed profile picture. Mark Beallo added a photo to profile gallery. Chained to my desk . . .